Masters of Taste 2016. Photo by Brian Champlin / We Like L.A.
You know what’s handy? Waking up in the morning, firing up your phone/computer and being able to scan a super quick (but curated) rundown of the best of what lies ahead. So here it is, our list of fun things to do in Los Angeles for today, Sunday, April 7, 2019. 3. [11 a.m.] The 6th annual Montrose Craft Beer Fest showcases brewers and breweries from the Los Angeles area. Guests can enjoy beers paired with delicious food samples, various booths, lawn games, music and more. 6. [11 a.m.] The Bowers Museum in Santa Ana is hosting a Cherry Blossom Festival with live entertainment and fun activities celebrating the spring bloom. 7. [noon] DTLA First Sundays is a community brunch meet-up that’s being going strong for five years. This Sunday they’ll host a five-year anniversary celebration at Imperial Western Beer Company featureing the usual fun vibes and jams, along with a special oyster eating contest. 9. 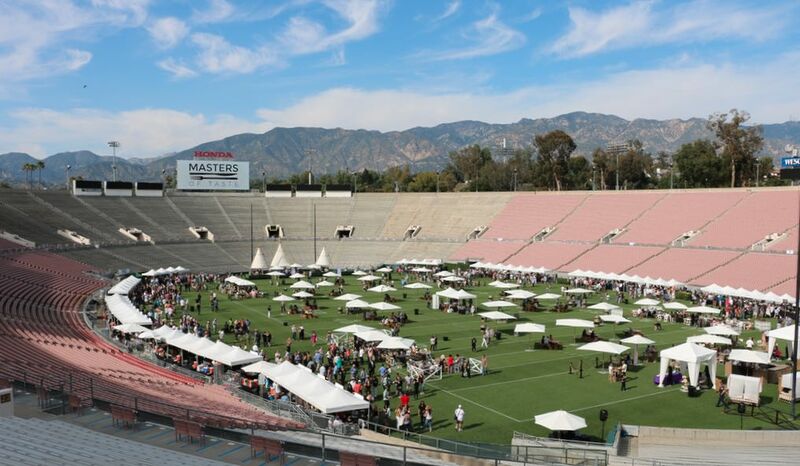 [3 p.m.] The fourth annual Masters of Taste returns to the field of Pasadena’s historic Rose Bowl on Sunday for food samplings from over 40 Culinary Masters and restaurants. All proceeds from the event go to Union Station Homeless Services. Use promo code WELIKELA19 for $15 off! 10. [various] If Halloween and horror movies are your favorite topics then I Like Scary Movies Experience will be just what you’re looking for. Guests can expect to see, hear, feel, and smell recreations of iconic moments from IT (2017), Beetlejuice, The Shining, The Lost Boys, and A Nightmare on Elm Street. There won’t be costumed actors jumping out trying to startle but there will be multi-sensory surprises along your winding path. The pop up experience runs April 4 through June 16 Thursday through Sunday.